(Recto) at bottom left corner, signed by the artist, "A Cuyp" in black chalk. Secondary Inscription: (Verso) inscribed "Coll. ten Cate 196" in graphite. Aelbert Cuyp was mesmerized by Holland's flatness. Using a long, narrow sheet of paper, he expressed vastness in breadth by compressing the landscape into thin strata that continue off the sides of the page. By choosing a low horizon line, he extended the openness to include a large area of blank, cloudless sky. He created aerial perspective and conveyed the sense of endlessness in depth by drawing the foreground in black chalk and the background in silvery graphite. 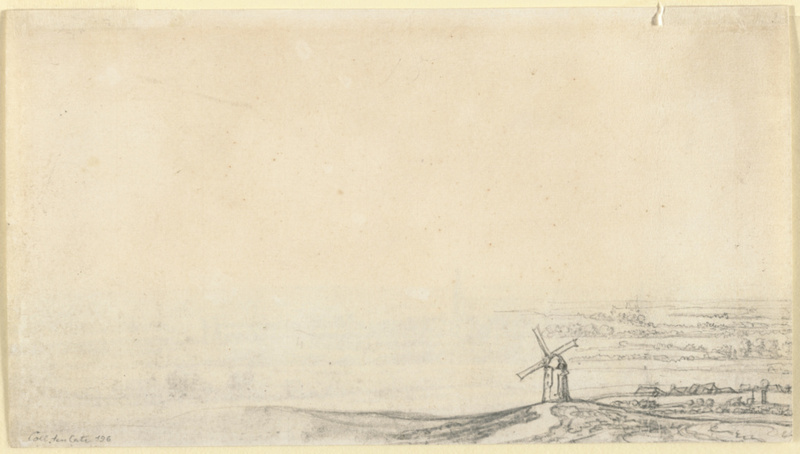 This view seems miniaturized: buildings, boats, figures, and even grazing animals are indicated by dots of chalk in the middle distance, while similar, even more abbreviated markings create a distant background. 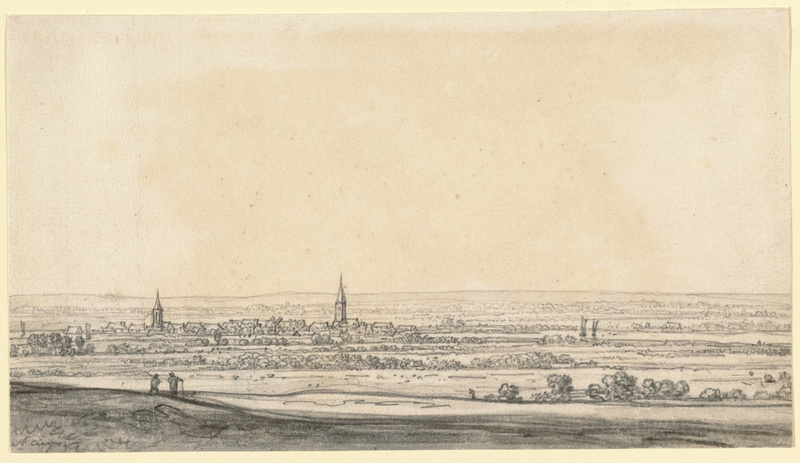 Cuyp drew this scene in a sketchbook he made on his journey to southern Holland and northern Germany in 1651 and 1652, but the exact location remains unidentified. The verso continues the scene from a sheet in the Musée Condé in Chantilly, France. The scene depicts Cleves, in present-day Germany, with this part showing the Heideberger Mill and a portion of the city wall. A slight discrepancy in size between the two sheets indicates that one or both of the pages was cut down.